St George Ashe was born at Castle Strange in County Roscommon.1 He graduated from Trinity College in 1676, and was elected Fellow three years later. He had a lively mind which led him into varied interests of a mainly scientific nature.2 As a Fellow of the Royal Society, he had contributed astronomical observations to its Transactions. The College was still recovering from its occupation by the armies of catholic King James II in 1690, when he was appointed Provost at only thirty four years old in 1692. Although he held the post for less than three years, he had an important influence on the intellectual atmosphere.3 A member of the Dublin Philosophical Society and a friend of William Molyneux (whom he succeeded as secretary of the society), he was, thanks to Molyneux's friendship with Locke, in close touch with the latest ideas in philosophy, science and mathematics; and although it was only several decades later that this found expression in the undergraduate course, it was of great value to graduate students and Fellowship candidates, including George Berkeley. 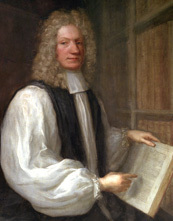 Ashe became Bishop of Cloyne in 1695; two years later he was translated to Clogher, and in 1717 to Derry. From 1702 to 1713 he was Vice-Chancellor of the University. Anne Crookshank and David Webb, Paintings and Sculptures in Trinity College Dublin (Dublin, 1990), p. 14. J.V. Luce, Trinity College Dublin, The First 400 Years (Dublin, 1992), pp 36-7.